Integrate Zoho SalesIQ with Clicky and track your live chat events. Get quick access to important stats of your live chat operations in a single dashboard. 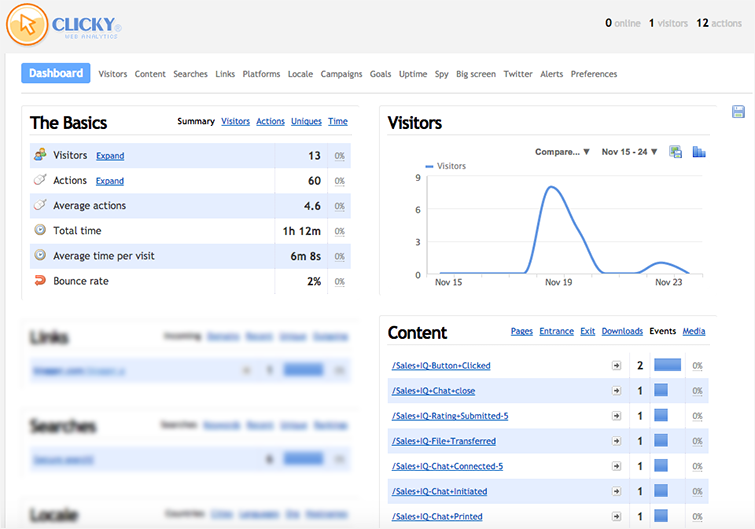 See live information about your visitors in your website. Once you have pasted the Zoho SalesIQ script into your webpages, the script will automatically detect the Clicky code available in your website. If everything is in place, Zoho SalesIQ will start reporting events to your Clicky automatically. All you have do is enable Clicky in the embed settings. Login to your Zoho SalesIQ. Go to Settings -> Integration tab, select Clicky. 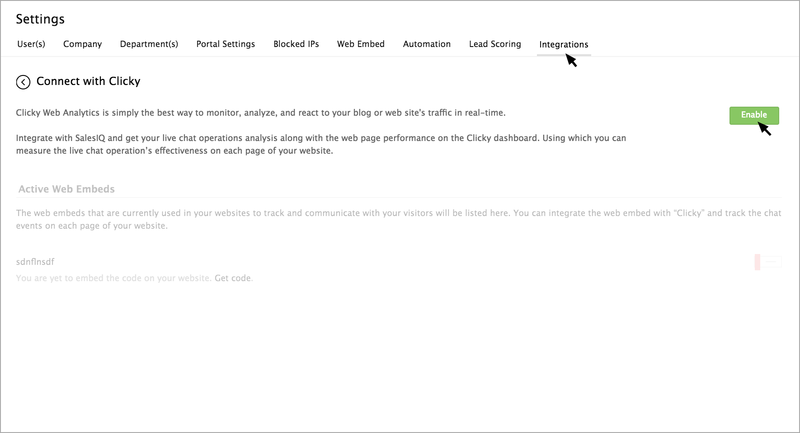 In the Connect with Clicky page, click Enable button. The Active Web Embeds and Inactive Web Embeds will be listed in the page. 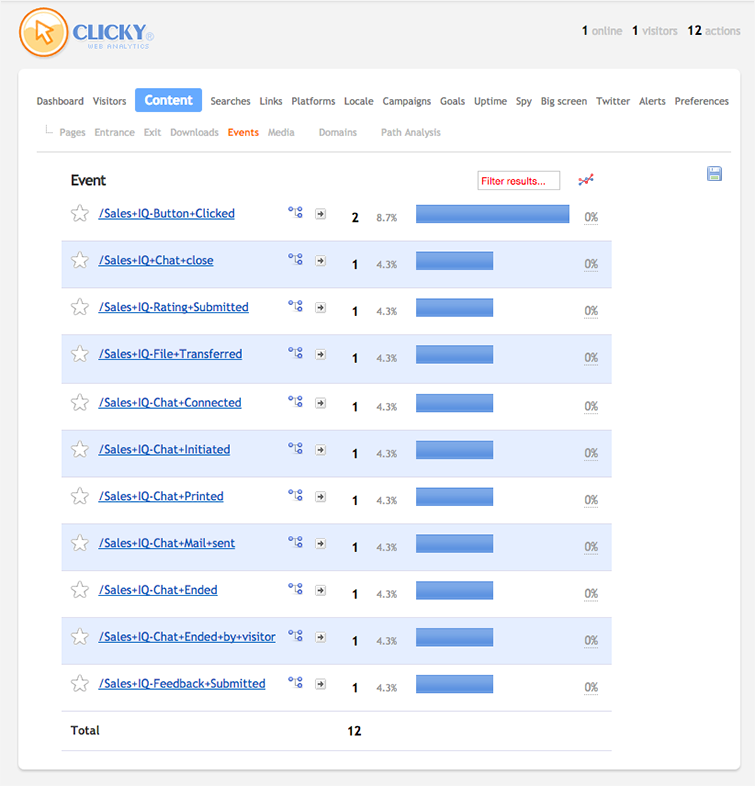 What are the events tracked in Clicky? Button Clicked Number of clicks on the Zoho SalesIQ chat button. Chat Closed Number of clicks on the Close (X) icon in the chat window. Chat Minimized Number of clicks to minimize the Zoho SalesIQ chat window. Bubble Closed Number of clicks on the Close(X) icon on the chat bubble. Chat Connected Number of chat sessions with the visitors. Chat Ended Number of chats ended by the visitors. File Transferred Number of file transfers made by the visitors. Chat Printed Number of chat transcripts printed by the visitors. Chat Mail Sent Number of chat transcripts emailed by the visitor. Rating submitted Number of ratings submitted by visitors. Feedback submitted Number of feedback messages submitted by visitors. Chat Triggered Number of auto and proactive chat initiated to the visitors. Chat Initiated Number of visitor initiated chats. Offline Message Submitted Number of offline messages submitted by the visitors. Chat Missed Number of chats missed by the SalesIQ users. Chat Ended by visitor Number of chats ended by the visitors. Accessing your Zoho SalesIQ live chat events on Clicky. Log in to your Clicky account. Click on the “ Content” then choose “Events”. Now you can see all the events listed down. 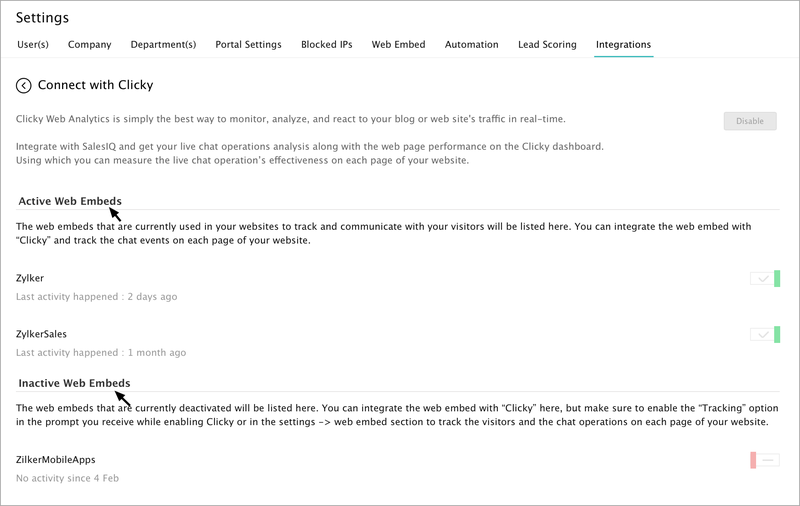 How to see the live chat events in real time from Clicky dashboard? Click on the “ Dashboard” then choose “Content”. Select events to see the Zoho SalesIQ events in real time.